First, a thanks to everyone who left us a comment. 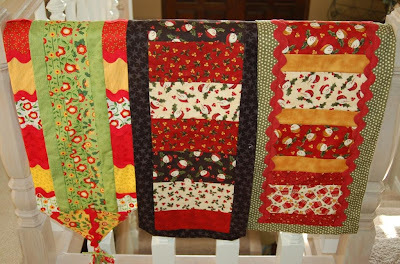 Janice and I both have our favorite quilts, but it is so fun to hear which ones ya'll like. We had comments from 29 states and 7 countries. Based on the comments, it looks like the book is as versatile as we hoped it would be. There was no clear favorite winner. They all got votes. So, now, as promised, 5 books going home with 5 winners. We took all the entries and assigned them a number, the we used the Random Number Generator to pick for us. Here we go. Thanks again, and if you didn't win, you can still buy the book on our website, http://www.abbeylanequilts.com/. Please email us with your mailing address at abbeylanequilts@yahoo.com . My local quilt shop is only three miles from my house. 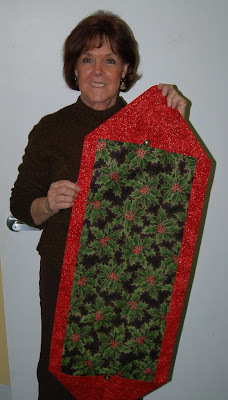 It is called My Heritage Fabrics and is owned by Marlene Lewellyn. If you are ever in Ogden, you need to stop by. When I stopped in the other day, she showed me her TEN MINUTE TABLE TOPPER. 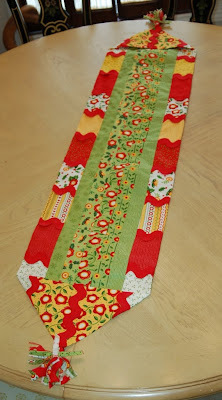 It is a quick pattern that needs only two pieces of fabric. 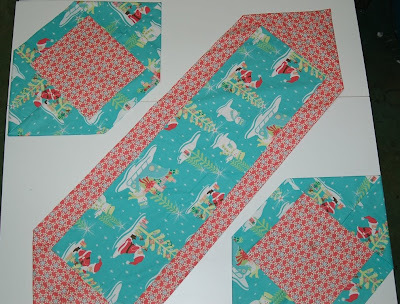 One piece is 1/2 yard x WOF and the other is either 10" or 12" x WOF. 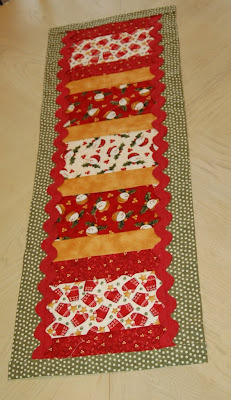 Marlene went a step further with the idea and made placemats to match the runner by cutting the runner in half. She has a pattern she can email you. Just send her a note and tell her you saw her runner on our website, myheritagefabrics@gmail.com. 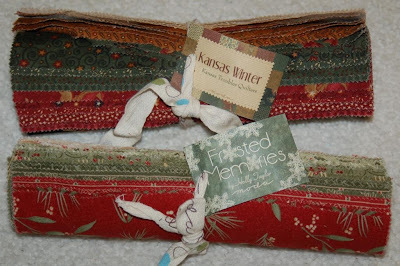 Check her blog also, http://www.myheritagefabrics.wordpress.com/. How cute are these. 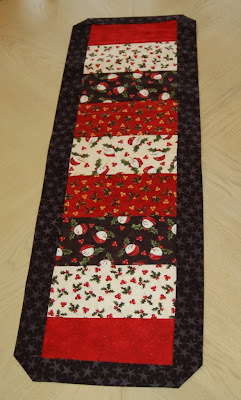 I bought a couple of half yard pieces of christmas fabric and headed home to make some. I had some assorted Moda Layer Cake bundles laying around. I decided to use two of them to make my TABLE TOPPERS. I ended up making three. I used the layer cakes to piece the front panels. 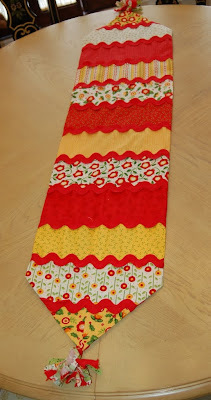 I couldn't do the fold down ends though, because they covered up some of the cute fabric pieces, so I altered the ends. The third one used layer cake pieces for the front and the back. When you see these, you will know why we design patterns. Janice and I have a habit of changing every thing we sew. Anyway, here goes. I added Ric Rac to the sides of this one and varied the sizes of the pieces in the front panel. This one took a little longer than ten minutes. Around 25 minutes with the cutting and Ric Rac. Another fun note, these are all reversable. How cute are green and cream polka dots. Another different end. This one had even strips in the front panel and took about 20 minutes to make. By the time I got to this one, I was having way tooooo much fun. The green front was 5 layer cakes cut into thin strips. The back was 12 layer cakes. I made this one longer, used the pointy end and added tassles. I put Ric Rac across the strips on the back so I could use either side. I can't decide which I like better, the front or the back. We have written more detailed instructions with lots of pictures and put in on our website, http://www.abbeylanequilts.com/. 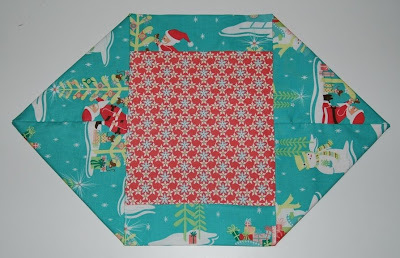 Just click on What's New and then click on Ten Minute Table Toppers, or follow this link http://abbeylanequilts.com/TABLETOPPER.html. This one did take about an hour and a half, but it was soooo much fun. Have a great week, and start making those TABLE TOPPERS. They make great gifts.